Everyone stand up and CHEER! In an industry marked by “we’ve always done it that way” insanity – not to mention dozens of people on my blog telling me recently that their calendar and magnet mailings still paid off – there is HOPE for the future! I’d like to award my first WELCOME TO THE FUTURE AWARD (I just made that up) to Shorewest Realtors of Winsconsin! First, some disclaimers: I have never worked for their company (yet!!) and I received a copy of their ad from a friend at Coldwell Banker United in North Carolina (which means top competing companies are keeping an eye on each other nationwide). But no matter – as a member of the slowest evolving business industry in the history of mankind – you should all be just as excited as I am to see it. I wonder if this is what it felt like when the first caveman stood up on two legs? 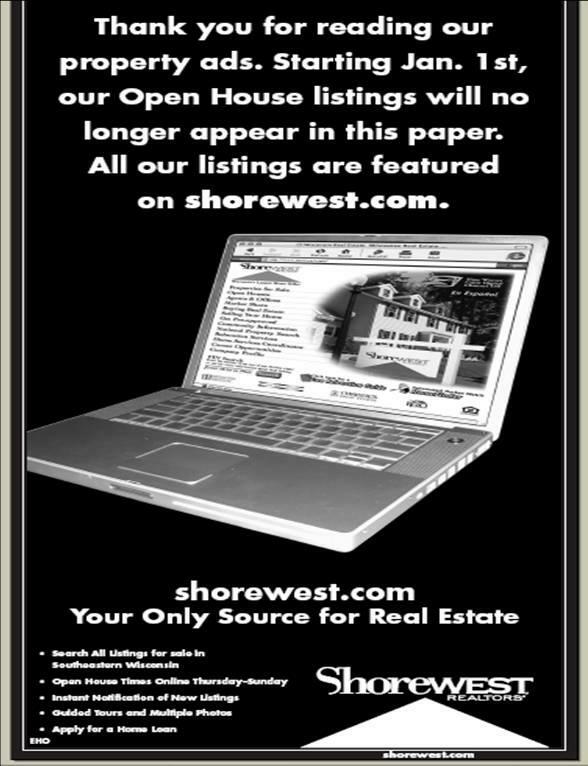 Other than discovering life on Mars, this copy of the “last” newspaper ad for open houses from Shorewest Realtors is clear evidence that the wheel wasn’t just an accident and we can learn from our mistakes. Unfortunately, for some readers, this news may come too late to be of any help; continued weekly research in my local newspaper indicates that there are many more brokerage-strategy-cul-de-sacs yet to fall off the Fittest Grapevine. Hire me to do a seminar for their agents on even MORE ways to use technology to sell homes. Buy every one of their agents a Blackberry so they can get all of the buyer inquiries from the online traffic they are about to generate for their listings. Hire their next three recruits on salaries and demonstrate how the profit-margin of future brokerages will work for everyone. Hire me to do a seminar for their agents…. Oh, did I say that already?? Grin! Whatever they do with the money – heck, throw one hell of a “We have arrived in the future!” party – this ad just makes my day! This is the right step for any brokerage, in so many ways: Cutting costs, marketing effectiveness, taking control of the marketing plan away from sellers, tapping into the Gen X/Y purchase preferences, and so many more ways this action represents the right approach for the future. I’m sure Shorewest isn’t the only one out there doing this, but I have to admit I admire their bold approach: Running a big, black-and-white ad highlighting the stark contrast between the old and new business models of the next generation of real estate. Taking a stand on a full page; raising the bar on the competition; and setting the standards of performance for marketing in their area. I only wish I could have seen the face of the advertising manager at the newspaper when they submitted the copy. It would have been priceless! As you can see – it’s going to be a great 2009 in Wisconsin real estate!